Our family shares very diverse opinions about what makes a great dinner. Dustin is adamant that a meal must be meaty. Meaning, the meal should contain meat or at least appear to contain meat. The children like to remind me on a regular basis that a meal should be visually-appealing, and should not contain any scary-looking (AKA: vibrant green or leafy) ingredients. Of course, they don’t actually use those words, but they certainly let me know by their actions. They also know about the one-bite dinner rule, but still test out its validity on a weekly basis. And I’m the veggie advocate. I’m always looking for ways to add more veggies to our dinner. 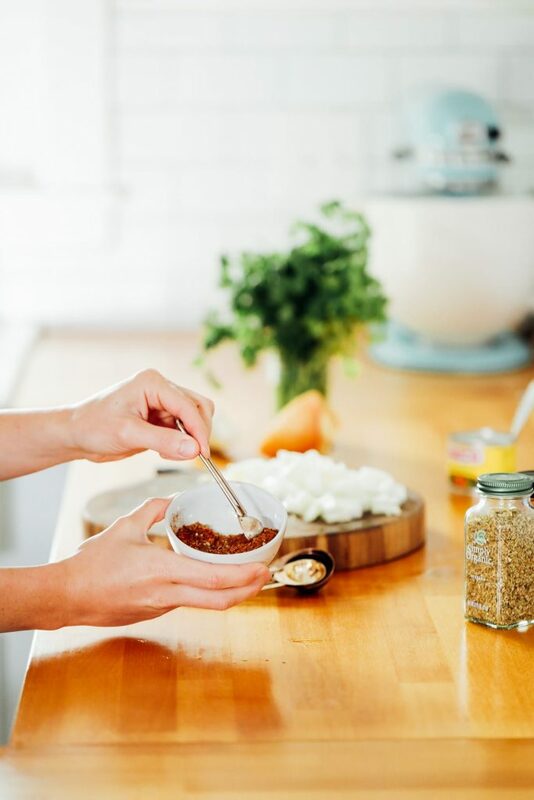 Sometimes this means adding a few carrots to a traditional chili meal, sneaking a couple of beets in a smoothie (shhhh), adding cauliflower as a taco filling option, or making a simple salad to serve with dinner. I’m certainly not a short-order cook, but I also think there’s a place for making meals that everyone loves on a consistent basis. I want meal time to be enjoyable, real, and delicious for my entire family. When a meal is a huge hit with everyone in the family, it’s immediately added to an on-going favorite meals list. 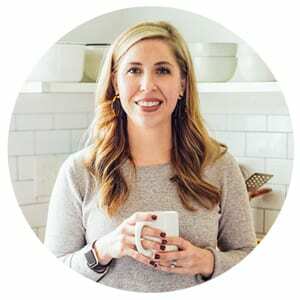 This list is my go-to resource for creating a meal plan each week. 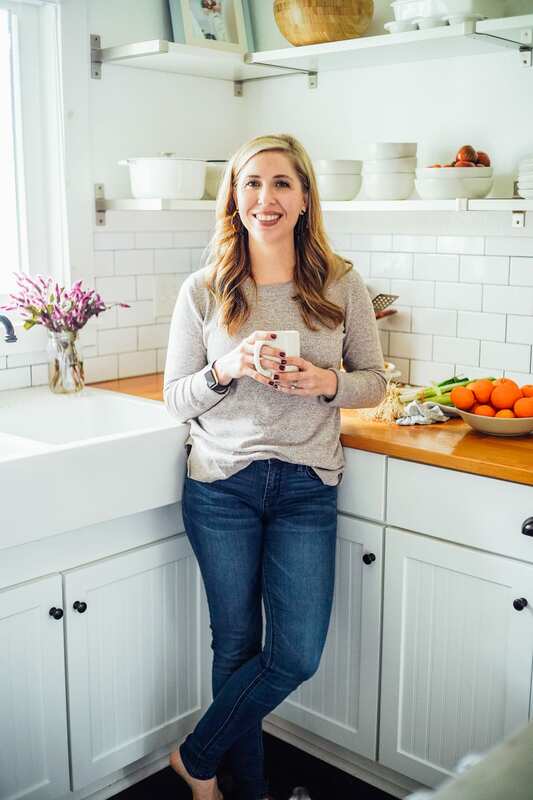 Thanks to this list, I know that most of the meals served at dinner will be well-received by the family. Sure, it’s impossible to please everyone 100% of the time, but at least a good portion of our weekly meals are both nourishing and well-loved. 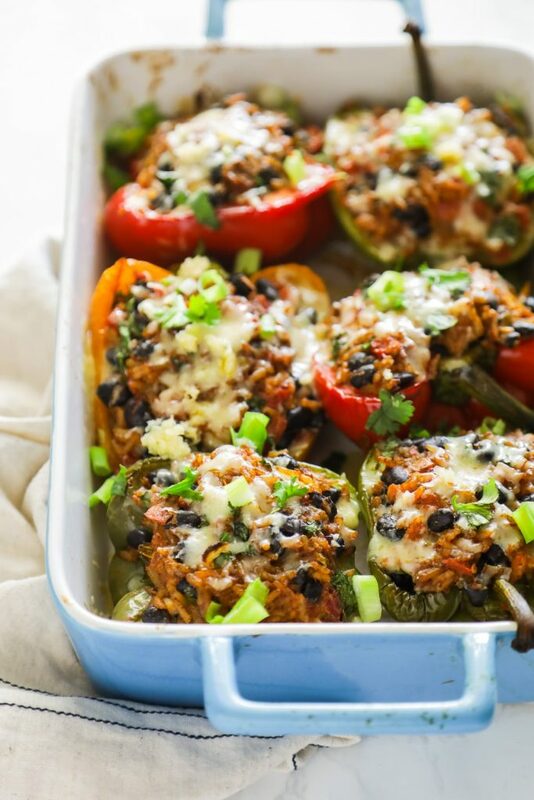 Stuffed peppers are always a family favorite. The kids don’t love the cooked peppers (yet), but they will eat the filling. Dustin loves the meatiness of stuffed peppers. And I love the veggie-filling possibilities. And even if veggies aren’t included in the filling, peppers (hello, veg) are always part of the meal. 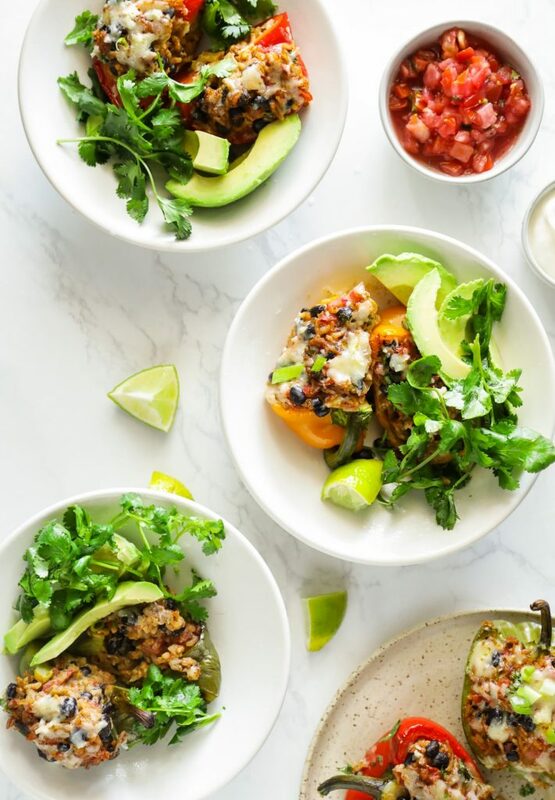 These Tex-Mex Vegetarian Stuffed Peppers are super easy to make and always a winner with the family. 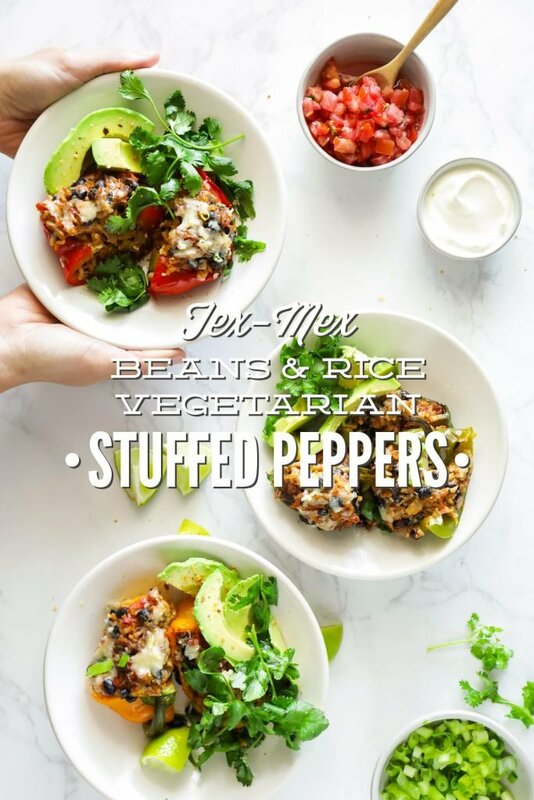 The ingredients are basic pantry ingredients (rice, beans, salsa) that come together to create an incredibly flavorful meal. The peppers are easy enough to make on a busy weeknight, or they can be prepped in advance and frozen. They also make a great make-ahead lunch. 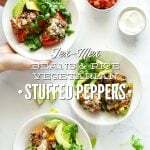 Hearty, vegetarian-stuffed peppers with a Tex-Mex-style filling of beans, rice, salsa, and taco seasonings. Make this meal for dinner, or prep the peppers in advance for a real-food lunch. Using a fine mesh sieve, rinse the quinoa or rice under fresh water until the water runs clear (about 1-2 minutes). Cook the quinoa or rice according to instructions listed on the bag. This step may be done in advance during a prep time, or use leftover rice or quinoa from a previous meal. 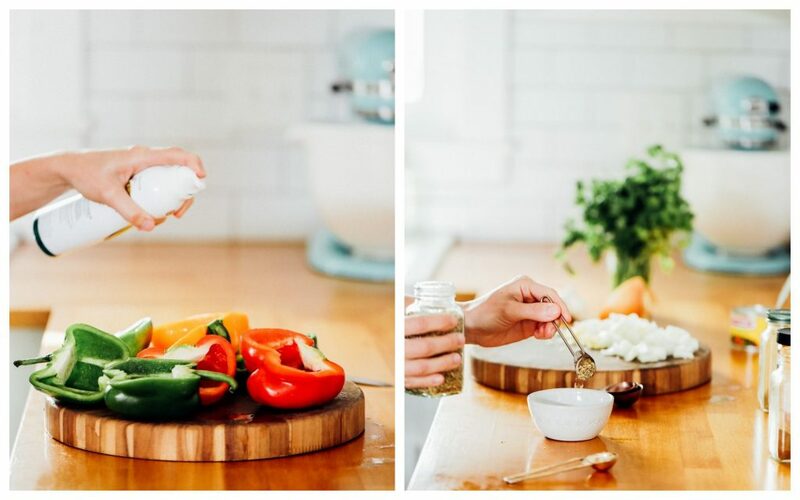 Grease a 13x9 baking dish or a sheet pan, and place the peppers side by side in the dish. 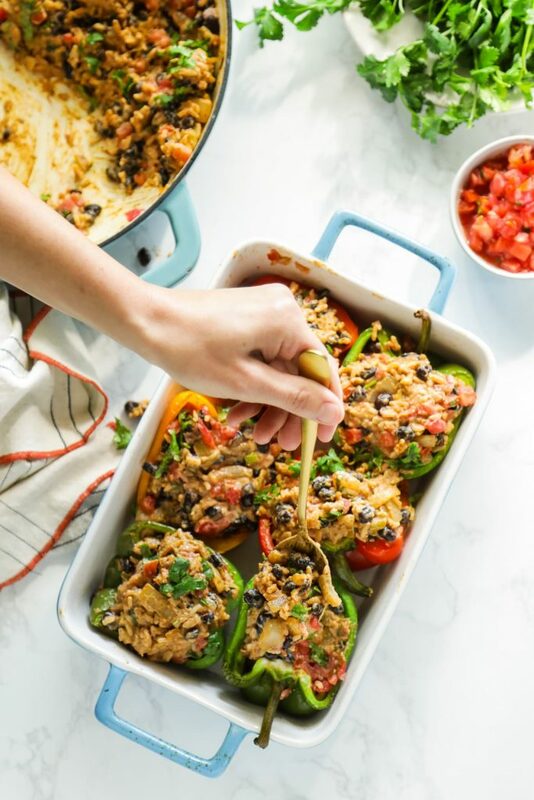 You may need an additional baking dish to fit all the peppers (or go with a sheet pan), if your peppers are very large. Brush the peppers with a small amount of extra oil and place them in the prepared pan. Cook the peppers for 15-20 minutes, or until slightly soft. Heat the olive oil in a large skillet over medium heat. Add the onions and saute until translucent, or about 5 minutes. Add the minced garlic, chili powder, cumin, oregano, and paprika, then saute for an additional minute. Stir in the cooked rice or quinoa, black beans, salsa, green chilis, sour cream, salt, and pepper. Cook for 2-3 more minutes to warm through. Add the cilantro. Remove the peppers from the oven. If the peppers contain any excess water, tip them over to remove it. Spoon the bean mixture into the softened peppers until almost overflowing. Bake for 25 minutes, uncovered, or until the peppers are soft and the filling is warm. 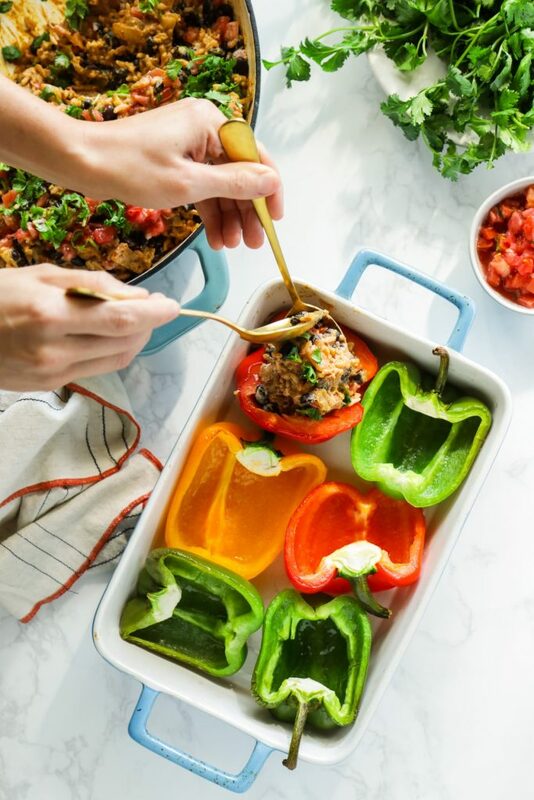 Remove the peppers from the oven, sprinkle cheese over the stuffed peppers and return to the oven, uncovered, for five minutes to melt. Serve hot with your choice of garnishes.